Piraeus Theoxenia Hotel Piraeus, Hotel Greece. Limited Time Offer! Piraeus Theoxenia Hotel. 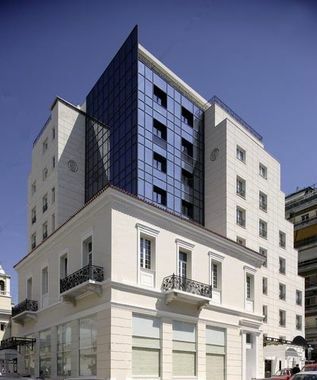 "Piraeus Theoxenia Hotel" is a hotel that has obtained 5 stars. The hotel is located in Piraeus. There is a shuttle bus service available for your transport needs. This hotel boasts 76 elegant rooms. The rooms are large. Warm weather is kept outside thanks to the relieving air conditioning. For visitors who like taking part in some sporting activities, the hotel offers various possibilities, such as pilates, tennis, golf, sailing, yoga and volleyball. Furthermore, the hotel hosts a gymnasium where you can exercise on your own as well as a bike rental service. You have the option to indulge yourself with a massage treatment. For children, there is a child care service available, to free parents for a while, while they play safely under the supervision of the trained staff. Don't forget to taste the Italian specialty of the onsite restaurant. After dinner, you can enjoy a drink at the lounge bar. Business travelers will appreciate the access to the Internet.